The LUNA is a revolutionary facial-cleansing and anti-aging device. Combining sophisticated T-Sonic technology with a soft, silicone brush, the LUNA provides deep yet gentle cleansing, leaving your complexion looking clearer, brighter and healthier. The reverse surface channels lower-frequency pulsations to reduce the visibility of fine lines and wrinkles, while helping to improve the absorption of skin care products. Requiring no replacement brushes, the LUNA is a more economical, as well as hygienic and a gentle solution than similar products on the market. 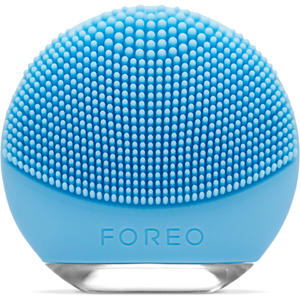 With the LUNA range, FOREO promises you radiant, healthier-looking skin and the confidence that comes with it. The LUNA is available in 3 different models that cater to specific skin types. The LUNA for Combination Skin features sturdier touch-points than the other LUNA devices, tailored especially for oilier combination skin. Nonabrasive Brush: Unique, ultra-soft silicone bristles for deep, yet gentle cleansing. Ultra Hygienic: Up to 35x more hygienic than nylon bristles. Anti-Aging Mode: Smooth massaging surface to enhance the absorption of your skin care products and reduce the appearance of fine lines and wrinkles. Economical: No replacement brushes needed and a 2-year limited warranty and 10-year product guarantee. Travel Friendly: Up to 450 uses per charge = charge your device once every 9 months. Smart Design: Fully waterproof and 8-speed adjustable intensities. To maximize the skin care benefits of the LUNA, we suggest you use it for 2 minutes each morning and evening. Press the center button once to turn on your LUNA. When activated, it will be in Cleansing Mode. Press the center button again to put the device on Standby (on Standby, the indicator will emit a steady glow and the pulsations will stop, giving you the chance to rinse your face). Press the center button a third time to activate the Anti-Aging Mode. Press the center button once more to deactivate your LUNA. The intensities of the LUNA's Cleansing and Anti-Aging Modes are adjustable for comfort using the +/– buttons, with a memory function that will remember your preferences for the next time the device is used. 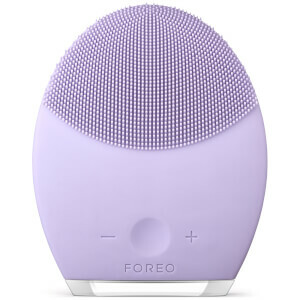 The individual stages of FOREO's cleansing and anti-aging routines are described below. After each stage of these routines, you will feel the T-Sonic pulsations momentarily pause and see the indicator light flash, prompting you to move on to the next area of your face. Note: The LUNA may be locked when first unboxed – unlock it by holding down the + and – buttons together. The light will flash to indicate that your device is unlocked. Should you wish to lock your device for travel convenience, follow the same procedure. Channeled through smooth, silicone touch-points, T-Sonic pulsations help to unclog pores of dirt, oil and makeup residue and remove dead skin cells. Try spending around 15 seconds cleansing each zone of your face; after this interval the LUNA's T-Sonic pulsations will pause momentarily. Remove all makeup, then dampen your face and apply your regular cleansing product. Turn on your LUNA by pressing the center button once, activating the Cleansing Mode. Start cleansing at your chin with gentle upward strokes along your jaw to your ear, moving gradually higher to cleanse the whole cheek. Change to the other side of your face and repeat Step 2. Then, starting from the center of your forehead, cleanse the entire region with gentle outward strokes to both sides. Now cleanse one side of the nose by gently gliding the LUNA up and down and then change to the other side of the nose. We suggest reducing the LUNA's pulsation intensity with the – button before delicately cleansing the under-eye region using outward strokes. After 1 minute, you will feel the pulsations pause 3 times in quick succession. Press the center button once more to put the LUNA on Standby and then rinse your face to complete the 1-minute cleansing routine. Please note that to prevent overuse, the LUNA will automatically switch itself off if left for 3 minutes in Cleansing Mode. The LUNA's Anti-Aging Mode diminishes the appearance of fine lines and wrinkles and leaves the skin looking firmer and more elastic. After 1 minute, you will feel the pulsations pause 3 times in quick succession. Please note that to prevent overuse, the LUNA will automatically switch itself off if left for 3 minutes in Anti-Aging Mode. This device holds a 2 year warranty - if the device stops working in this time (apart from mistreatment) we will replace it with a new device. Complete with a 10 year quality guarantee. This product comes with a USB. This is the second one I purchased. The first one broke after over 2 years of consistent use. I use this every evening for a full 3 minutes on face and chest and neck area. It stimulates the skin and does not irratate. Actually I want to buy the Luna TM2, but bought Luna TM by accident,before I receive the product that I found Luna TM2 at a reduced price, and more cheaper than Luna TM. so sad about that. But it's more clean after using this one, better than using my hand. Been using this for a couple months now. I have a really oily t-zone which was constantly clogged with blackheads and debris. I tried the Clarasonic years ago and wan't gaga about it and returned it. When I saw this I wasn't sure how it could possibly clean my skin like they claimed but it really does. The pores in my t-zone have shrunk considerably to being non-existant. I used to be able to squeeze the pores in my nose and lots of gunk come out, now barely anything to nothing comes out when I do it (and I only use it 75-80% of the time - I get lazy sometimes and just do a quick hand wash :-().If you have a lot of congestion I suggest giving it 2-4 weeks to completely clear it out. It won't happen over night but little by little it will.The other thing is that this is SO gentle, no scratching or irritating the skin. You don't have any brush heads to replace every quarter and the charge lasts a LONG time.All in all I highly recommend this little baby. I'm so glad I bought it - SO worth the investment. I can't imagine going back to washing with just my hands!! Skin treatment and cleanser in one. I purchased this product 3 months ago and love the difference in my skin. My enlarged pores have shrunk, skin is smooth, resulting in getting rid of my old make-up foundation and purchasing a new lighter one. I also do not need a make-up primer anymore. No more having to buy replacement brushes and no more frequent recharging. In fact, I use this product every day and have not had to recharge it yet. I will be buying another one for my daughter.